Charlotte (called "Charlie") is about to finish high school and she is the youngest of the five Grant siblings, who have been the subject of their mother's family-oriented comic strip, Grant Central Station, since they were very young. Now, though, the comic strip is coming to an end, and the family home is being sold, so Charlie's sister's wedding weekend is the last chance for her and her brothers and sister to be together in their childhood home. Unfortunately, not everything about the weekend - or even the wedding - goes according to plan. Mike, one of Charlie's brothers, has been estranged from the family for over a year due to a falling-out with his mom. Danny, Charlie's oldest and favorite brother, shows up for the wedding with a girlfriend no one has heard about, and whom Charlie instantly dislikes. Charlie herself is also preoccupied with a love interest - Jesse, Mike's best friend, whom she kissed at Christmas and hasn't seen since. When the wedding planner skips town suddenly, and a substitute is called in, Charlie also finds herself partnering up with Will, the new wedding planner's nephew who clearly likes her, and whom she helps to combat the series of mishaps threatening her sister's wedding day bliss. I can't remember the last time I read a young adult novel that I loved as much as I loved this book. It was a perfect blend of contemporary romance and family drama, and every single character charmed me and made it impossible to put the book down. The mother's comic strip, and specifically its coming to an end just after the wedding, gave the book the exact right feel of nostalgia and longing for the past that often accompanies planning for the future at the end of high school. I could completely empathize with Charlie's feelings, and with her desire for just a few more days of togethernness with her siblings before everything changes. The problems with the wedding itself were also written really well. 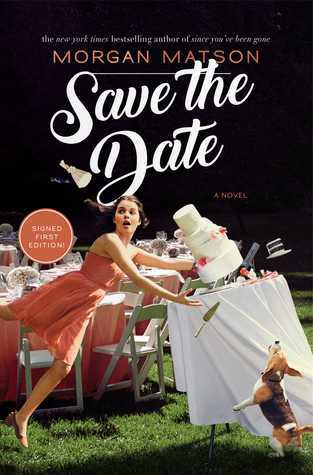 Though they were funny and somewhat unlikely, the author completely made me believe in them as real things that can go wrong during a wedding ceremony. I also appreciated that each of Charlie's brothers and her sister felt like real adults, but that their friendships with Charlie also felt plausible. They acted like siblings, not surrogate parents, and I don't think we get a lot of older siblings like that in teen fiction. This year is not quite half over, but I already know this will be on my list of favorites come December. It's just such a heartwarming and pleasant book, and it was a great way to kick off my summer reading. I’m glad you liked it! I’ve seen this book everywhere, and I always get so distressed for that poor cake. I look forward to reading this one, since it looks super cute! Is it fairly clean? For the most part. The book opens with a prologue involving the main character and a boy kissing on a bed, but it doesn't go further than that. I think there is a second similar incident later in the story, too, but it was brief. Most of the story is about her family and the wedding.